The Brewer Howdy again. So you want to know about airlocks humm! Well the first thing to is that airlocks are also called air traps or more commonly just traps, also bubblers although this is a type of airlock but we'll get to types presently. An airlock is a device used by nearly all wine makers and some beer makes. Its purpose is to allow gases released from the fermentation to escape while preventing oxygen from the atmosphere from entering the container and potentially spoiling the wine / beer. It is essentially a one way valve. 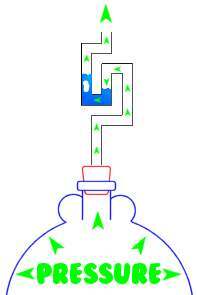 It is quite easy to see how an airlock works. The first thing to remember is that the fermentation container is sealed, so as the yeast ferments the sugars in the liquid they release gas, as gas is less dense than the sugars the internal pressure increases, this forces a bubble of the new gas up through the airlock, once the pressure has equalized the bubbles stop. The important factor is that the is never more pressure on the outside of the container so the bubbles never flow backwards and the liquid is protected from the outside atmosphere. The good news is that airlocks are easy to setup and do not require much attention once in use. Well that's about it on airlocks, there are perhaps two other things you may like to know, one you can make your own airlock. To do this you force a length of syphon pipe into a bung and place the bung in the neck of your fermenter, you then place the other end of the pipe in to a glass of water that stands next to your fermenter. This method is favoured by some beer makers especially in America (enclosed fermentation). It can also help with keeping clean if you find that you get lots of wine must bubbling though your airlock. A second thing to note is that some people do not use water in there airlocks, but instead place yeast killing agents like hydrogen peroxide, or water with a large dose of sodium metabisulphite dissolved in it, while this can lower the small chance of a wild yeast entering though the airlock it also means that if the container is knocked or if one is not careful in removing the airlock some of this liquid could enter the wine and the result would be much worse than if it was just water.